Bot Colony. The game you speak with. The only game where you converse in English with robots who understand what you say. Bot Colony is truly unique – it’s the only game where you converse in English with robots who understand what you say (or type) – a radically new gameplay experience. The game is not limited to commanding robots, you can actually investigate by using your own words and discover the back story. Experience interactions with machines that were just sci-fi fantasy in movies like Her, Ex Machina, iRobot, Blade Runner and 2001-A Space Odyssey. 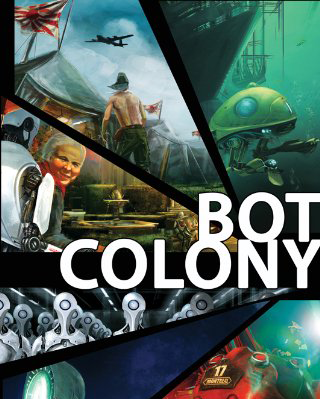 Bot Colony might be the first game to really nail the dream of full vocal interaction. Nakagawa Corp., Japan's leading robot manufacturer, asks for your help. Its South Pacific sanctuary, the island of Agrihan - known as Bot Colony - was infiltrated. The robots are acting strangely. As Agrihan is mostly staffed by robots, you'll need to converse with them in English and command them to get the job done. The first real evidence of espionage has been uncovered on Agrihan, and Nakagawa has turned to enlist outside help. Nakagawa Corp has prepared a virtual training simulation of a home break-in that will test your ability to function within its robot operated facilities. You must first discover what happened in the house in the 48 hours prior to the break-in and why the house is empty. Next, you’ll direct a robot to remove all traces of this intrusion. If you pass the Intruder challenges, Nakagawa will entrust you with the mission of finding the spy. In Intruder you see and control Jimmy through cameras embedded in the walls. You can also look through his vision sensors (play in first person). In Arrival, you’ll play in third person, and you get to choose your male or female character. You’ll use your robot communications to acquire the equipment for your mission. If you’re able to think clearly and quickly under pressure, you’ll help Bot Colony avert great danger. Conversation with the characters makes Bot Colony gameplay unique. Characters understanding what you say is really new. We've developed advanced Natural Language Understanding (NLU) to bring you a unique experience. Shooting and blowing stuff up, fighting, looting, crashing cars, and jumping from platforms are already handled quite well in other games. Bot Colony brings you a novel game experience: you’ll make progress in the game if you communicate successfully with the characters. Bot Colony offers the player a unique experience of interaction with artificial intelligence. Novels like "2001: A Space Odyssey" and "I, Robot", and movies such as Blade Runner wonderfully romanticized Artificial Intelligence, but as of yet no work of art has made AI truly interactive. This unique experience will challenge your mind and entertain you; the ultra literal way that robots understand language will make you realize how much we take for granted when we speak with other people. In Bot Colony you will communicate with the game's robot characters using your own words instead of pre-arranged dialogue. Experience a new, natural kind of interaction: Forget the scripted dialogue trees and canned responses common in other games. Our game characters understand English well enough to enable players to complete objectives and game levels. Off topic conversations are also supported, and characters use them as an opportunity to share what they know - and to learn new concepts taught to them by the player! Back story and world design contains story elements from the novel, and highlights the differences between the game and the book. The robots in the Bot Colony novel differ from AI's portrayed in Ex Machina or Her in realism: any robot dialogue appearing in the Bot Colony novel is feasible with software that's advanced enough, and the novel actually predicts what conversation with future robots will look like. Dialogues like those in Her or Ex-Machine won’t be feasible in our lifetimes. The novel tells a sci-fi story and the game makes YOU the key protagonist in it, able to experience this story first hand. In Bot Colony, the characters understand English in a 3D environment (situated environment). They will understand references to object, commands, and can answer questions about events they witnessed. You can even teach them new commands. This is made possible by a robust Natural Language Understanding pipeline, that supports references to surrounding objects.